If you look very closely going toward Raymond on Raymond Road, directly across from Rod & Gun Rd..look into the woods and you will see a cellar hole. The house pictured below stood there. This was originally built by William Locke in the 1700’s. Sadly the house burned April 10, 1905 when Martha Sheare owned it. It had been called the Glass house for years as a Mr. Glass lived there and was found hung in the woods behind it. Suspicion was that Mr. Glass was killed by his son-in-law. 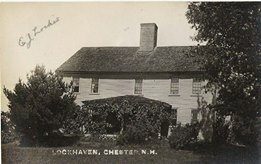 The Locke’s came to Chester to what was called the homestead by the branch. The branch is the river on the Raymond line. The Locke family has the oldest family Association in the United States. They still today have a reunion every year. William’s Grandfather, Capt. John Locke bought the property in Chester for William, his grandson. John came from England and settled out at the Rye coast. The story goes that he was out in his field working, out in Rye, when an Indian came alone and killed him. But before he died he cut off the Indians nose! The NH History Museum has the sickle under glass which was used to cut his nose off with the story! And in their storage area his sword also is preserved. The descendants of William Locke lived in Lockehaven over 100 years. Rufus Moore and Margaret Locke, daughter of Capt. Wm. Locke bought the house in 1854. Henry Moore and Laura lived at Lockehaven. Laura was born to Abigail Locke. All Locke’s up to this point are buried at the cemetery on the Raymond line. 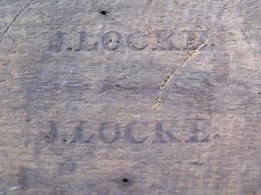 James Locke was a cooper (barrel maker) Found in a wall in Lockehaven was a board which has his barrel stamp on it. James’ daughter Eleanore Locke was a teacher in Chester and after she retired from teaching Eleanore ran Lockehaven as an Inn here in the late 1800’s when the trolley brought people from the cities to Chester in the hot summers to be cool. She also sold dinners at the Inn and a board (nothing was ever wasted) was found in the wall that said “Chicken Dinners 1.00”. 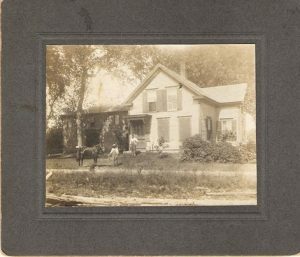 Three post cards were sold at Wilcomb’s Store of “Lockehaven”. The key to her trunk was found in the attic and is framed today in the house along with her picture. Eleanore never had children and left her home to a niece Clementine Locke/Backman when she passed away in 1932. Both James and Eleanore Locke are buried in the Village Cemetery. When Clementine Locke/Backman inherited the house from Eleonore they started Backman Greenhouses which then moved to Derry, NH as Backman Florist. Much glass has been found out in the back yard from the greenhouses! Backman Florist is still in Derry today but owned by someone else which has kept the name. 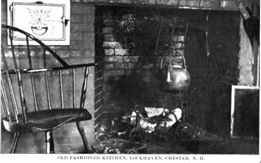 Lockehaven is a center chimney house, post and beam. It has 5 working fireplaces. Luckily poor people always lived here, thus so much of the original 1700’s still stands intact. The house has its original windows and as you drive by you can see the wavy glass. But it was not the Locke’s who built the house. The property Lot M was owned by the first minister Rev. Hale and then sold to the second minister Rev. Flagg. Rev. Flagg which lived in the “L” at Bittersweet Blessings gave it to his son Josiah Flagg. Josiah Flagg and his wife died within weeks of each other (possible small pox?) in 1799, the same yr. that George Washington died. They left young girls to a guardian. Girls could not inherit property therefore the house was sold by what is called a straw man. This has created a problem in doing research on the house as 50 yrs. is missing from 1799 to 1854 when the Locke family bought it.